I enjoy musicals on many, many levels. Two of these levels are enjoying a show for the spectacle, and for the content. For me, the original direction of The Phantom of the Opera is all about the spectacle. I've written about this before: I don't see Phantom to get any food for thought. It's fun for the 80s megamusical visuals, but it doesn't engage me on any deeper level. That changed last year. 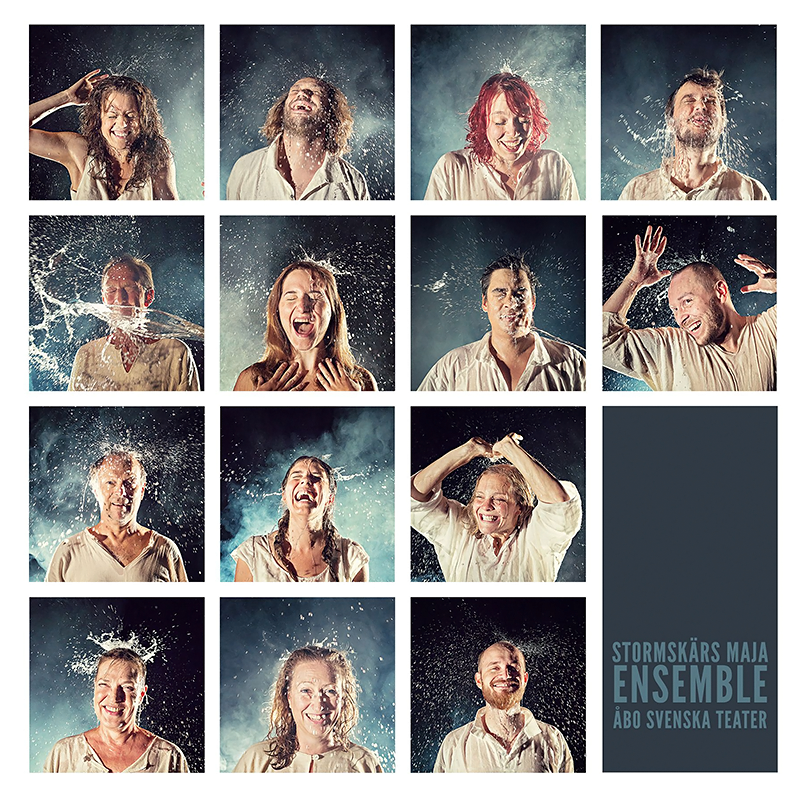 The Estonian non-replica production proved that this musical can tell a story that interests me. 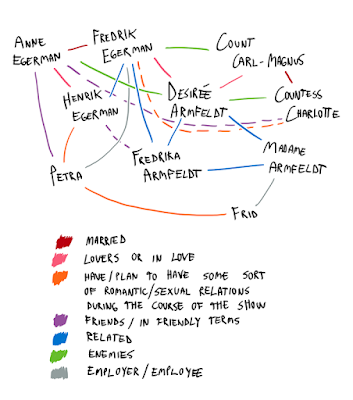 The Estonian version didn't focus on the love triangle in between the young ingenue, the rich aristocrat and the mysterious Phantom. Instead, it told an fascinating coming-of-age tale about a brave, talented woman. The new Finnish non-replica production of The Phantom of the Opera goes back to the roots. Finnish National Opera's take on the Phantom's story is enjoyable for the sights and sounds, but it remains quite empty inside. 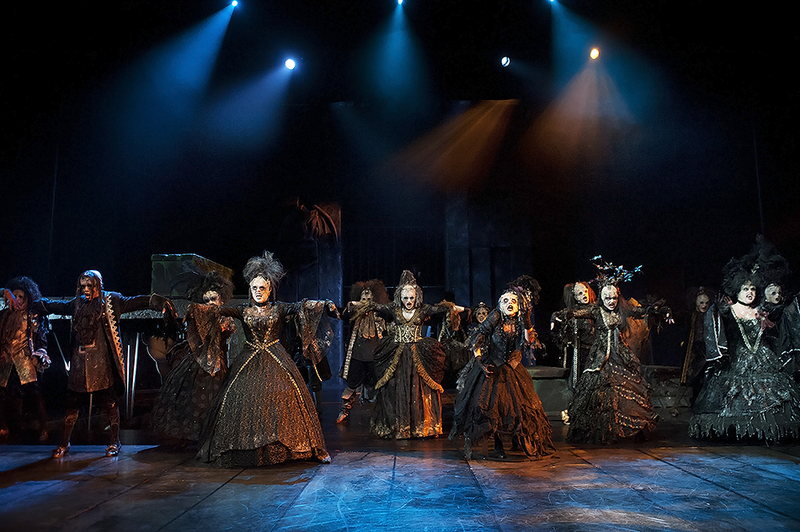 The Phantom of the Opera is a huge show, literally. Finnish National Opera's big stage is really wide and deep, and the auditorium seats 1350 people. 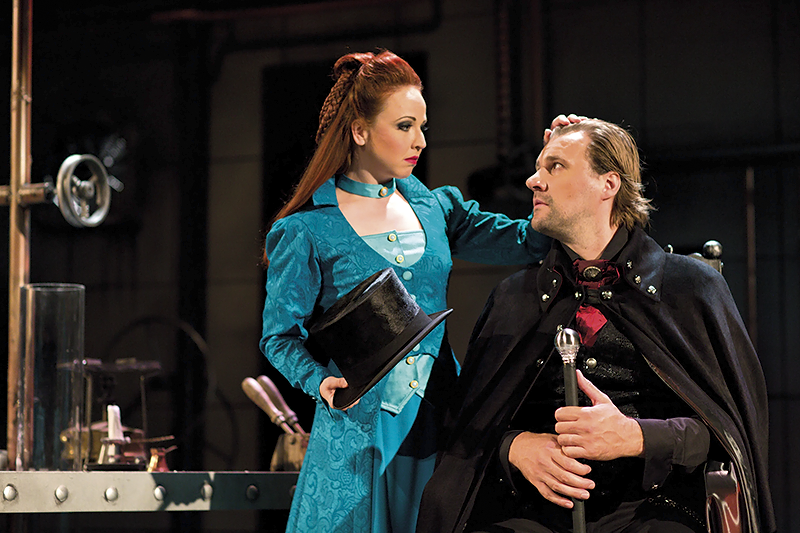 For the most part, set designer Teppo Järvinen does great job turning the vast stage into an opera house. Järvinen creates many beautiful scenes, such as Phantom and Christine's descent to the Phantom's lair via a series of stairways, the Phantom's underground lair itself with its chandelabras and vines, and the rooftop of the opera house with its huge angel statue. 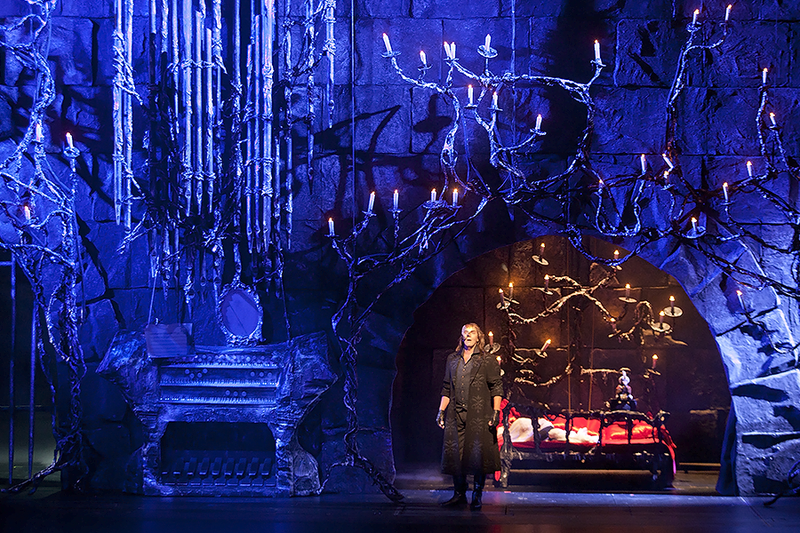 Combined with Timo Alhanen's lights, the sets leave some strikingly gorgeous impressions. 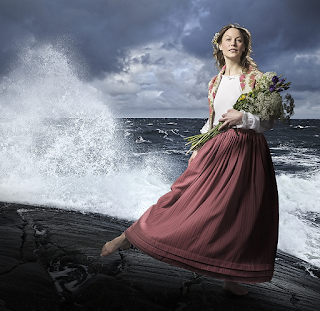 Marjaana Mutanen's costumes have their ups and downs. 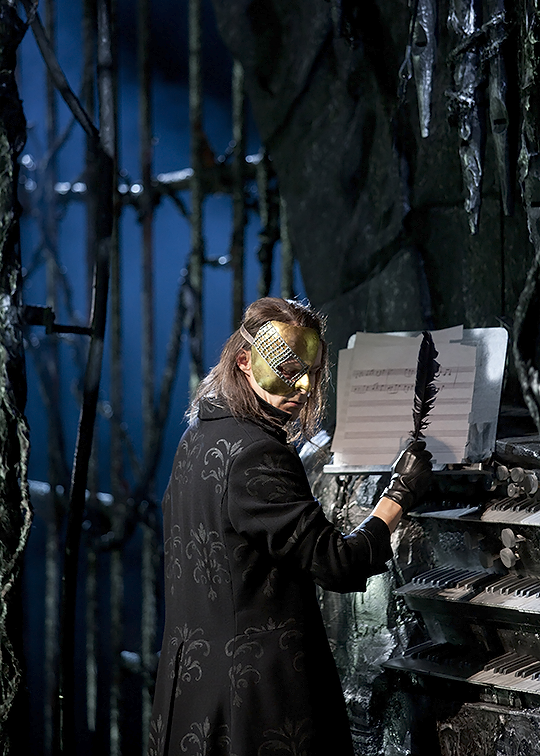 I like the Phantom's unique rock star meets goth meets hippie look, with his golden mask and leather gloves. Christine, then, could pop out a little more – now, with her plain white and black costumes, the leading lady feels a bit lost into the crowd. The ensemble costumes are nice but not especially memorable. I really like the way the show portrays the opera house. 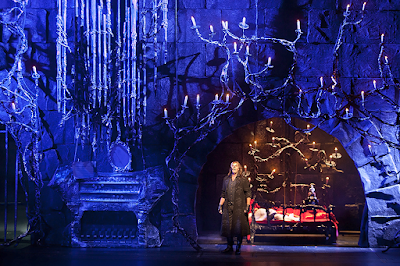 Many scenes take place backstage, with ensemble members wandering around and sets being built as the managers read the Phantom's latest notes. The hustle and bustle brings life to the scenes. Not to mention it's rare to see an ensemble of this size onstage, so the crowd scenes are worth seeing for the spectacle alone. But maybe the dancing scenes, with Osku Heiskanen's choreography, could be more impressive? The musical has plenty of ballet dancers in the ensemble. I think they should get more time in the spotlight. Finnish National Opera has a large orchestra and a big choir. Andrew Lloyd Webber's music sounds really lush and really beautiful, grander than I've ever heard it. The musical is lovely to listen to. But... 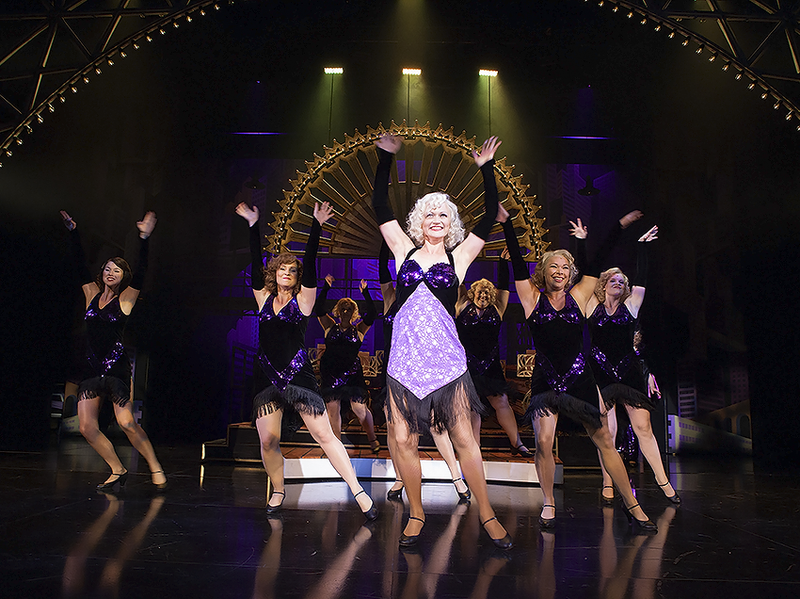 In musicals, music and lyrics go hand in hand. 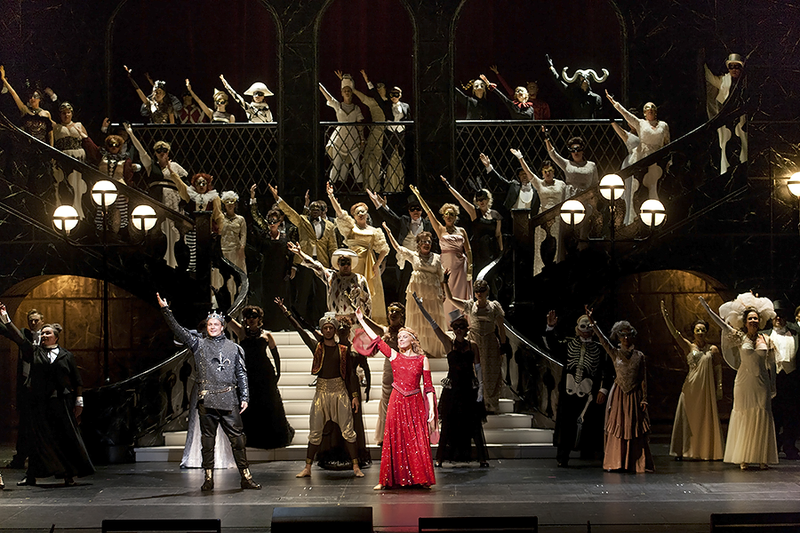 So, the Opera's decisions to perform the musical in English bothers me. Of course, Finnish National Opera usually performs operas in their original language, and it seems their initial plan was to hire an international cast for their new musical production. 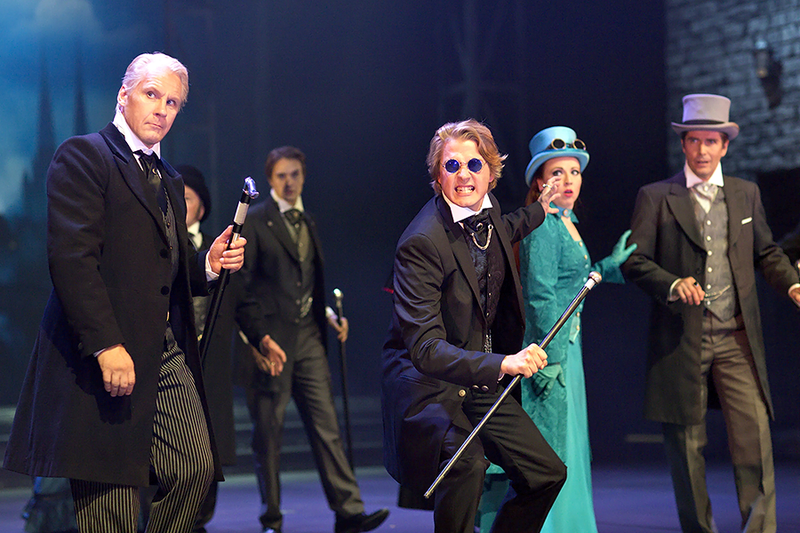 The Phantom cast, however, is mainly from Finland – save for the Christines, who are from Estonia and Sweden. The audience is also mainly Finnish. With all 70 000 tickets for the show sold out in advance, the production certainly doesn't have to advertise to foreign musical fans now. So it's a mainly Finnish cast with a Finnish accent performing in English for a mostly Finnish audience (sort of like this blog, actually. Ha!). I think it's a shame. Unlike classic operas, Phantom is usually translated into the local language when a new international production opens. I would have preferred to hear the world's favourite musical in my native language. I'm sure international audience members could've kept up with the plot by reading the excellent subtitles the Opera offers for all of their productions. Looking past the smoke and the mirrors, the sights and the sounds, Tiina Puumalainen's direction isn't to my tastes. Director Puumalainen doesn't give the Phantom's story any truely unique twists. The show is nice to watch, but it doesn't really make me think or feel for the characters. I have mixed feelings about the flow of the show. The first act moves forward rather smoothly, but during the last scenes of the second act, the focus is lost. Suddenly, I have a hard time following the characters' motivations. The final scene feels especially confusing. 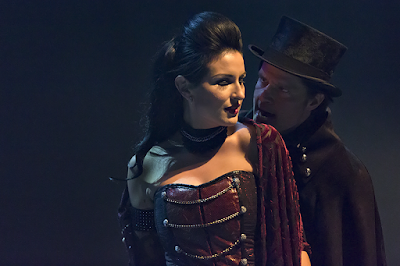 You need to believe Christine really loves Raoul for the scene to work, but here, I felt none of that. Partially, that is because the Christine/Phantom/Raoul trio is not particularily well balanced. 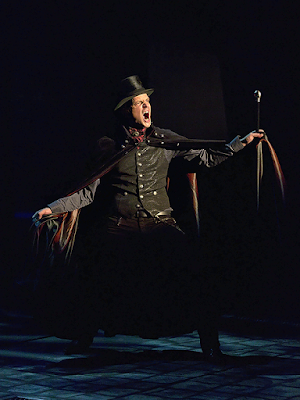 Olli Tuovinen's Raoul was presented as an angry, overly confident young man who fails his fiancée in her moment of despair. 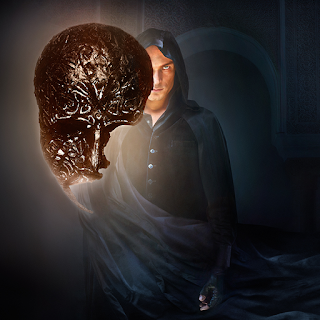 Ilkka Hämäläinen's Phantom, though he sings beautifully, is no more attractive. 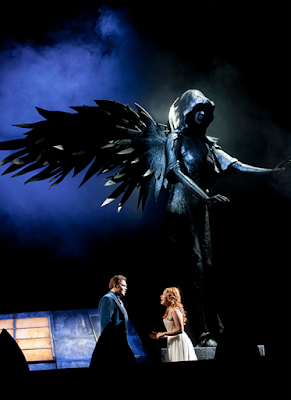 His Phantom is as a repugnant recluse who feels childish joy in Christine's presence. Valid interpretations of the characters in their own right, but together and in the context of this production, they don't work out. Why would Christine bother despairing over these two? Just ditch the creepy guys and start a new life as some other opera house's star soprano! I hear the alternate cast offers completely different takes of the main characters (read more in Finnish in Laura's review). Maybe I would have enjoyed them better. On the positive side, Kaisa Ranta's Carlotta charmed me. A perfect prima donna, she delivers a hilarious performance with a fantastic voice. I adore her. The way she literally rolls up her sleeves during Il Muto to show the Phantom who's the boss is maybe my favourite detail! Direction-wise, the show does have some clever little moments. I especially like the bit with the Phantom composing his big opera after The Music of the Night. It's made clear the loud music plays in his head – so no one needs to wonder why his organ playing doesn't wake Christine up but the music box does. Another favourite moment is the Il Muto ballet, with the dancers stumbling onstage one by one, throwing their socks and dressing gowns into the wings as they rush to take their places. 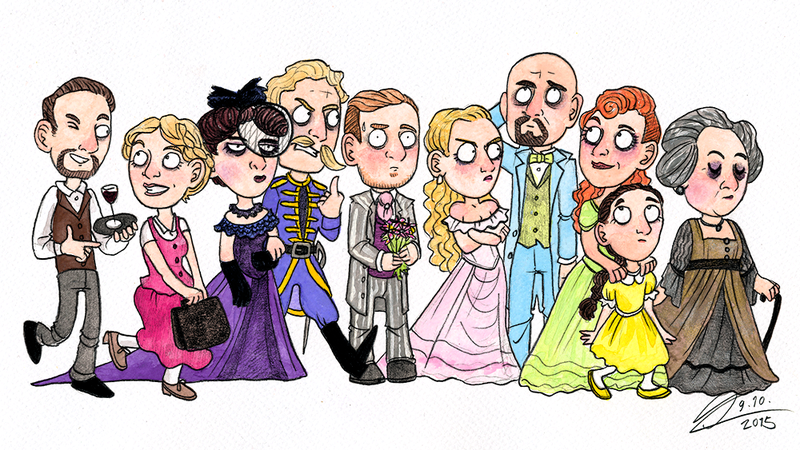 I also enjoy the three operas-within-musical included in the show. 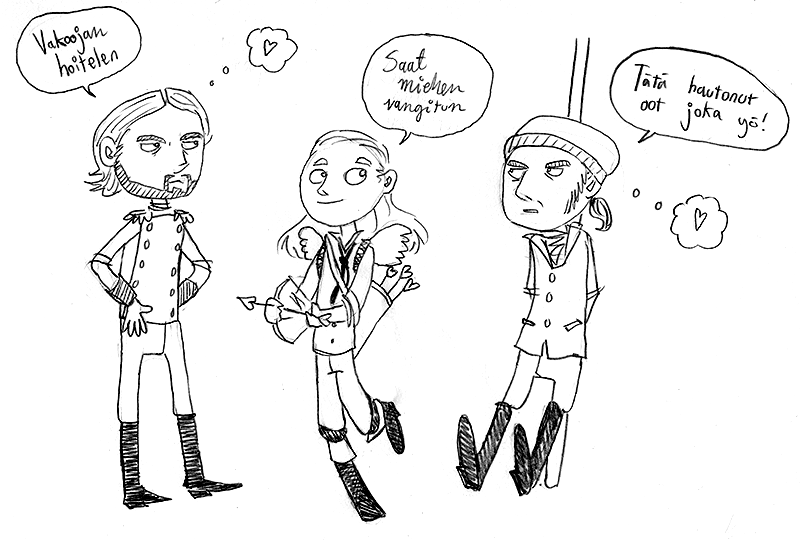 They're especially fun to watch when you remember you're watching a musical production by Finnish National Opera. The Opera pokes a little fun at itself during the opera parodies. Don Juan Triumphant, the Phantom's big work that's performed near the end of the show, amused me the most. The scene's deliberately modern visuals brought back childhood memories of the times my mom took me to see dance and opera at the National Opera. Little Siiri felt as confused by the productions we saw back then as the characters in the musical feel about Phantom's radical new piece. 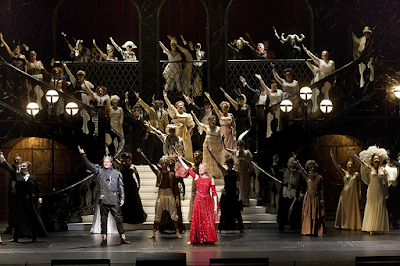 Watching Finnish National Opera's production of The Phantom of the Opera, I felt happy and entertained. The show is nice and easy to watch, with some strikingly gorgeous visuals and beautiful music. But thinking the production over, there is not too much below the surface to really interest me. It's a fine show to see once or twice, but I doubt it's anything to remember. I've another ticket in my pocket, but honestly, I'm already looking forward to seeing the Estonian production again instead. 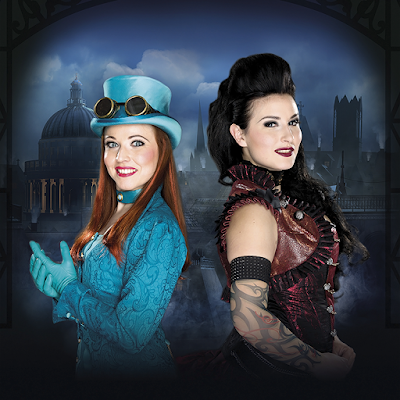 Please note: Jyväskylän kaupunginteatteri invited me to see the premiere of Jekyll & Hyde for free. The invitation was a thank-you for writing an article about the musical's history for the programme. When you go see the show, don't forget to buy one or three. Before I delve into Jyväskylän kaupunginteatteri's new production of Jekyll & Hyde, I need to make a disclaimer. I've made it before, but it bears repeating. I do not think Jekyll & Hyde, composed by Frank Wildhorn with a book by Leslie Bricusse and Steve Cuden, is a good musical. 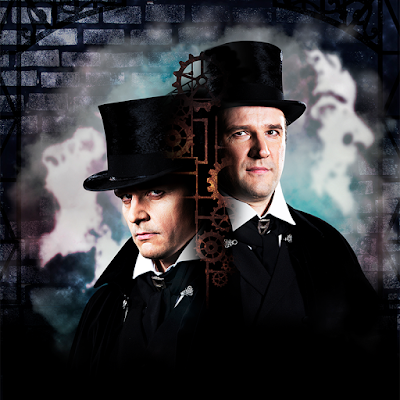 And yet, if you've read my blog for a while, you know I also call Jekyll & Hyde one of my top three favourite musicals of all times. 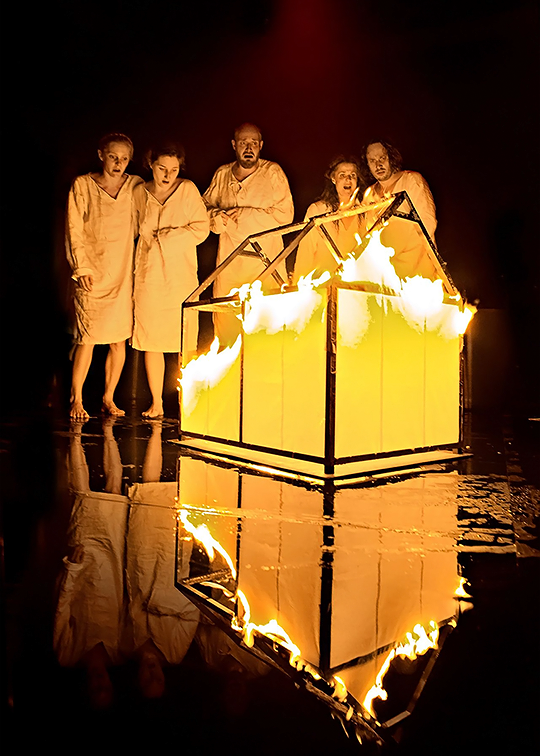 That is solely because of Turun kaupunginteatteri's 2013–14 production, directed by Tuomas Parkkinen. That production did the impossible: it turned a terrible script into a magical experience that has haunted and inspired me ever since. It wasn't by any means perfect, but somehow, the elements clicked together so well that the whole was ten times more than the sum of its parts. With tweaks and additions to the script, with unique directional choices and top-notch casting, and with help from gorgeous visuals, Parkkinen was able to lift the production way, way above the mediocre source material. 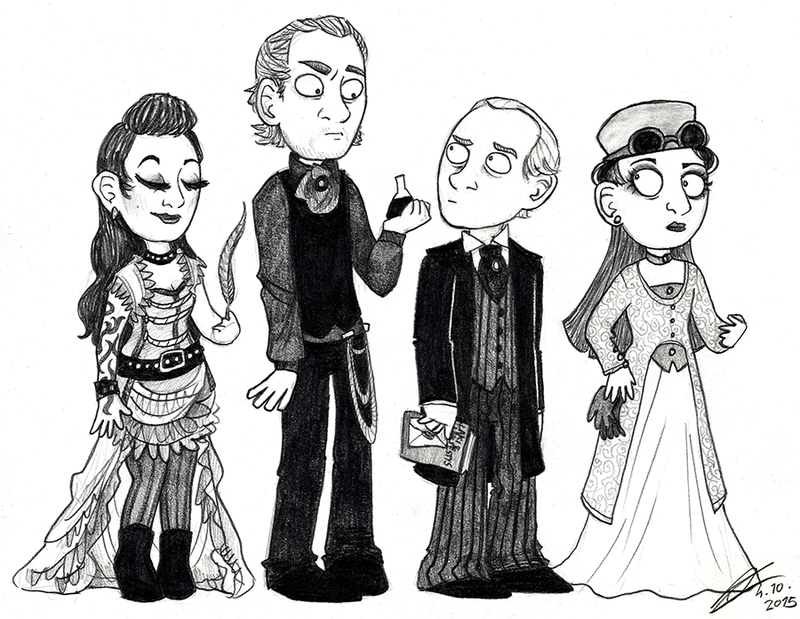 After seeing the Turku production, I've been watching bootlegs to find another Jekyll & Hyde I'd really enjoy. So far, no such luck. The productions I've watched are laden with directional clichés and tacky performances – and yet, I keep watching. I know there is potential. I want to see the show saved again. It's a true love-hate relationship with a strong obsessive streak. This autumn in Finland, the miracle almost happens again. Jyväskylän kaupunginteatteri's Jekyll & Hyde avoids many of the clichés and does many things right. And yet, it is no more than a good production of a lacking musical. Let's again start with the bad things. Jyväskylän kaupunginteatteri's Jekyll & Hyde is imbalanced. 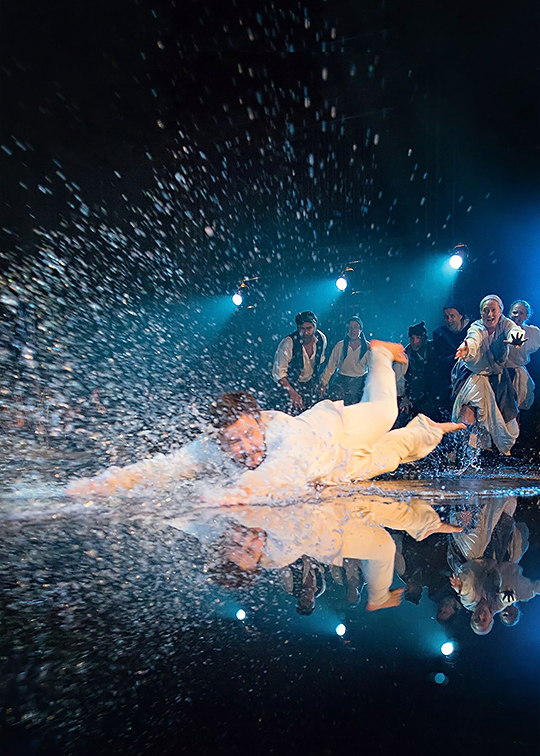 The first act is moves at a good pace, it's filled with interesting details and fun to watch. The second act falls quite flat. 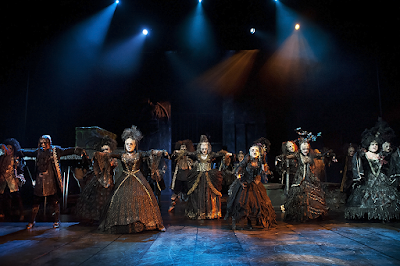 After the intermission, the show suddenly feels slow, boring and laughably melodramatic, even for the gothic horror genre. 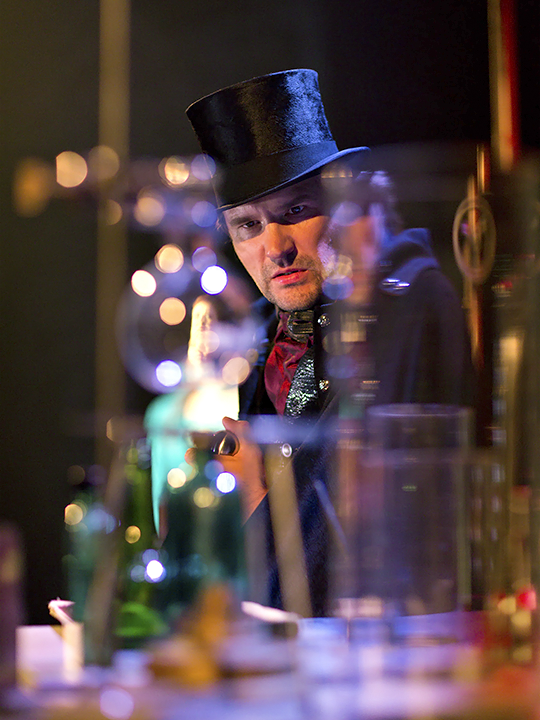 I was especially disappointed with the scene that culminates the second act, Jekyll and Hyde's duet Confrontation. A duet in between two sides of the same man, it's a hard scene to get exactly right – but it's as if this production didn't even try. Common tricks for distinguishing whether it's Jekyll or Hyde singing include changing the lights or the actor varying his posture or even flipping his hair back and forth... Here, none of that. I suppose leading man Henri Halkola did his best, but even so, I really had a hard time telling which one was supposed to be singing. Actually, Confrontation was not the only time I had difficulties telling the titular characters apart. 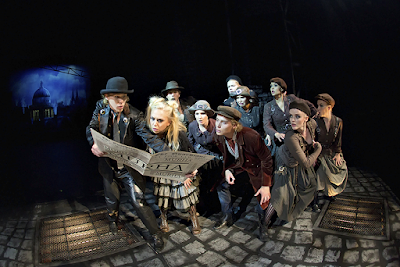 Maybe director Anssi Valtonen was trying to make a point, underlining the two-sides-of-the-same-coin aspect of the characters – but I believe a more clear distinction would work better onstage. 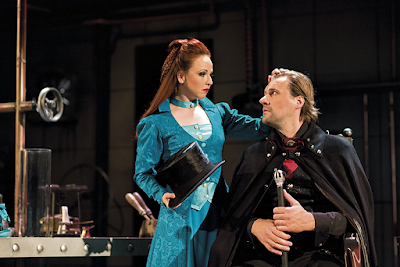 Saara Jokiaho and Maria Lund as Jekyll and Hyde's respective girlfriends, the upper-class Emma and prostitute Lucy, add as much personality and thought into their underwritten characters as humanly possible. The female leads are in a perfect balance, both shining but neither overshadowing the other. One of the finest Emma and Lucy duos I've had the fortune of watching. I also really enjoyed Hannu Lintukoski's Utterson. 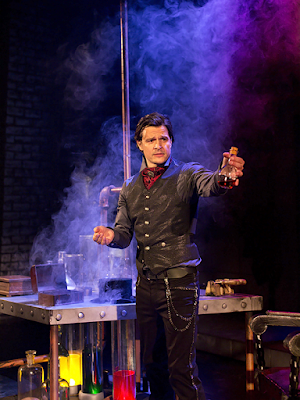 In international productions, Jekyll's friend and lawyer is too often portrayed as a living, breathing piece of scenery Jekyll can open his heart to. Luckily not here! Lintukoski's performance is a good mix of comic relief and old-fashioned gentleman, calm manners and heartrending worry for his friend. Loyal to the very end, everyone would be lucky to have a friend like him. The show looks lovely. Marjatta Kuivasto's sets and Merja Levo's costumes create a pretty, steampunk-inspired world for the characters to explore. I especially like Emma's bright turquoise costume and pilot glasses perched on top of her hat. The often overshadowed character makes a visual impression from the first moment. Just by looking at her, you can tell she spends her free nights cruising the streets of London in her state-of-the-art steam-powered car! The direction emphasises some aspects that usually get overshadowed. I especially liked Hyde and Lucy's relationship... though I wonder if like is the right word to use. I mean to say I was both terrified and fascinated. Hyde's calm abuse is scary to watch. I also applaud Halkola's efforts at painting Jekyll as a three-dimensional character, with both good and bad qualities, though his hands are somewhat tied by the script's Henry Jekyll is a perfect saint point of view. The first act has a perfect light tongue-in-the-cheek tone. The show doesn't take itself too seriously and is peppered with dashes of humor. For me, that's the best way of making a heavy melodrama like this enjoyable. 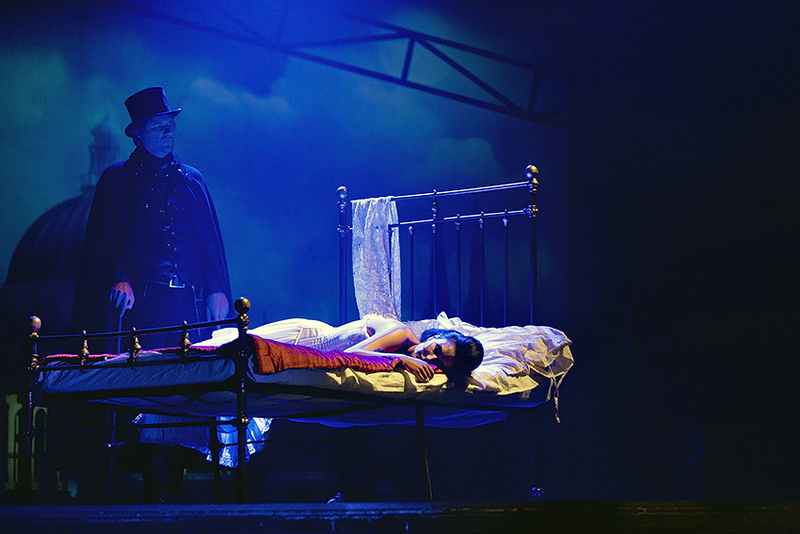 I'm glad I saw Jyväskylän kaupunginteatteri's production of Jekyll & Hyde. I will go see it again. I can tell the creative team has thought about the story a lot, the production is clearly made with love. It's a fine take on the source material – but in the end, my problems with said source material hinder my enjoyment. The show is well worth seeing for all its good aspects and very entertaining, more entertaining than any of the international bootlegs I've watched. But it's still Jekyll & Hyde the musical. Edited to add 2/12/2015: I'm having second thoughts. Read my addendum to this review. Keskisuomalaisen kriitikko Aino Martiskainen tylyttää tiukasti – mutta aiheesta. Mielipiteeni käsikirjoituksesta tiivistyvät täydelleen Martiskaisen arvostelussa. Dear international readers: this post is about Finnish musical translations. It's inspired by a new Finnish production of A Little Night Music. Read more about that in English. Miten ihana, miten harvinainen tunne oli istua Tampereen Työväen Teatterin Desirée – Pieni yösoitto (A Little Night Music) -ensi-illassa Juice Leskisen kääntämiä Stephen Sondheimin lyriikoita kuuntelemassa. Musikaalihahmoilla oli toisilleen ja yleisölle paljon kerrottavaa. Laulunsanat vilisivät sisältöä, asiaa, huumoria, kaksoismerkityksiä. Katsoja sai oikein odottaa, mitä laulussa seuraavaksi sanotaan. Penkissä ei tarvinnut kärvistellä myötähäpeän kourissa eikä naureskella tahattoman kaksimielisiä sanavalintoja. Sen sijaan sanottua täytyi ajatella ja pureskella. Fiilis oli outo. Keskimääräisen suomalaisen musikaalikäännöksen voi nimittäin päästää toisesta korvasta suoraan toisen kautta ulos juuri mitään menettämättä. Kovin usein suomennos tarjoaa oivallusten sijaan itsestäänselvyyksiä. Esimerkki. Monet fanit riemuitsivat Kansallisoopperan erikoisesta päätöksestä jättää Oopperan kummitus -musikaali kääntämättä. Mielestäni reaktio kertoo paljon siitä, millaiseksi suomalaisten musikaalikäännösten laatu koetaan. Toki musikaalien alkuteksteissäkin on hurjia eroja. Esimerkiksi Sondheim tai Tim Rice tarjoilevat kuuntelijalle lyyrisiä koukkuja, kun taas vaikkapa säveltäjä Frank Wildhornin Jekyll & Hyde -työpari Leslie Bricusse luottaa musiikin voimaan ja täyttää laulut latteuksilla. Mielestäni jälkimmäisen kaltaisessa tapauksessa on hyväksyttävää, jos taitava kääntäjä jopa lisää tekstiin hieman sisältöä. Käänteinen ilmiö on kuitenkin yleisempi. Jo alkujaan löysähköt tekstit löystyvät usein suomennettaessa entisestään, ja vähäisetkin syvällisyydet muuttavat muotoa ja katoavat. Ammattikääntäjiä käytetään ikävän harvoin tehtävässä, joka kuuluisi antaa heidän käsiinsä joka kerta. Otetaan esimerkiksi vanha inhokkini, Jukka Virtasen Les Misérables -käännös. Kääntäjä Kristiina Drewsin kanssa useita musikaaleja suomentanut Virtanen on monen mielestä lahjakas sanoittaja ja minunkin mielestäni koomisten musikaalisanoitusten konkari – esimerkiksi Virtasen Chicagossa on monta hykerryttävän hauskaa heittoa. Mutta kun samalla hupityylillä ei millään voi painaa kolme- ja puolituntisen kurjuuden ylistyslaulun lävitse. En vieläkään ymmärrä, miten kyseinen räpellys on kehdattu esittää ammattilavoilla jo kahteen kertaan. Virtasen Kurjissa barrikadilla koetaan yllättäviä eroottisia hetkiä. Tämä ei ole yksittäistapaus. Tuntuu, että tyylitaju on suomalaisella musikaalikäännöskentällä keskimäärin kadoksissa. Desirée-käännöksessään englannin kielen kääntämistä opiskellut Juice yrittää esittää suomeksi Stephen Sondheimin polveilevat, monimielisyyksiä pursuavat alkuperäislyriikat. Tietenkään joka säe ei ole täydellinen. Paljon jää suomeksi sanomatta ja moni ajatus muuttuu matkan varrella – mutta Juice tekee silti todella hienoa työtä taidokkaista sanoituksistaan tunnetun Sondheimin tekstiä suomeksi tulkitessaan. Väittääkö Välinoro siis tosissaan, että Juicen olisi pitänyt meitä yksinkertaisia suomalaisia varten yksinkertaistaa ja sensuroida alkutekstin sisältöä? Ei puhenäytelmäänkään mennä tuijottamaan näyttelijöitä lasittunein silmin vuorosanoista välittämättä ja toivota sitten lopuksi, että hahmoilla olisi ollut vähemmän sanottavaa. Ihmeellistä, että tällaista tyhmistämistä suorastaan kaivataan musikaaleilta. Minä väitän, että tässä maassa ollaan yksinkertaisesti kriitikosta rivikatsojaan niin tottuneita kelvottomiin ja kädenlämpöisiin käännöksiin, että hyvän käännöksen kuunteleminen tuntuu työltä. Kas kun sitä pitää todella kuunnella. Keskittyä ja ajatella. Hyvin käännetty musikaali ei ole pelkkää musiikki-ilottelua, vaan kappaleiden sanoista voi – hyvänen aika sentään – paljastua syvällisiä ajatuksia! Tämä on niin harvinaista, että se hämmentää jopa ammattiarvostelijan. Haluaisin siis esittää kaikille suomalaisille teattereille pyynnön: panostakaa musikaalikäännöksiin. Osaavien tekijöiden puutteesta ei ole kyse. Juice on poistunut keskuudestamme, mutta taitavia kääntäjiä löytyy maastamme kyllä. Itse haluaisin nostaa hattuani Seinäjoen kaupunginteatterissa esitetyn Vampyyrien tanssi -musikaalin kääntäneelle Marika Hakolalle. Hakolan upeaa käännöstä kuunnellessani unohdin täysin, ettei musikaalia ollut alun alkujaan kirjoitettu suomeksi. Hyvä käännös ei ole ylimääräinen menoerä vaan tärkeä tapa tehdä alkuperäisteokselle oikeutta suomalaisen yleisön korvissa. Loppukaneetti: myönnän, että aina en välitä tekstistä. Juuri viime kuussa Rocky-musikaali tärähti suoraan sydämeen ilman yhtäkään ymmärrettyä lyriikkaa. Olkoon tämä säännön vahvistava poikkeus – ja jos Rocky joskus tuodaan Suomeen, se on paras kääntää tavattoman huolellisesti, jotta minäkin viimein ymmärrän! 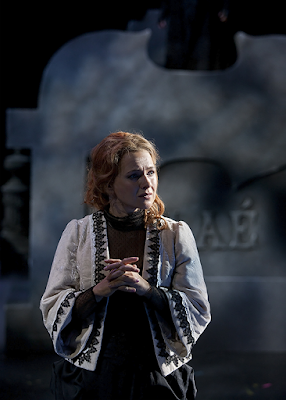 A Little Night Music – or, in Finnish, Desirée – Pieni yösoitto – is a hard musical to summarise. I think the best way to go is a chart. 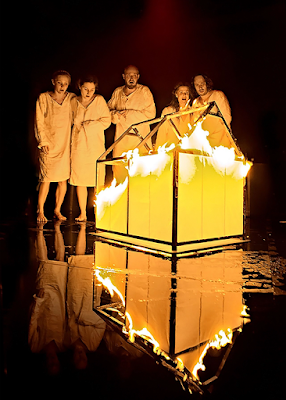 I already used this in my preview post of Tampereen Työväen Teatteri's new production of the show, but I shall recap here. Take this combination of characters, enclose them in a country manor for a weekend, and see what happens. 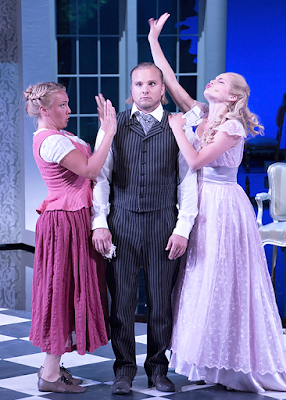 A Stephen Sondheim musical based on Ingmar Bergman's movie Smiles of a Summer Night, A Little Night Music is sort of a romantic musical farce with a cutting edge – whipped cream mixed with razorblades, it has been described. The characters are all looking for love, and everyone feels trapped in their own way. 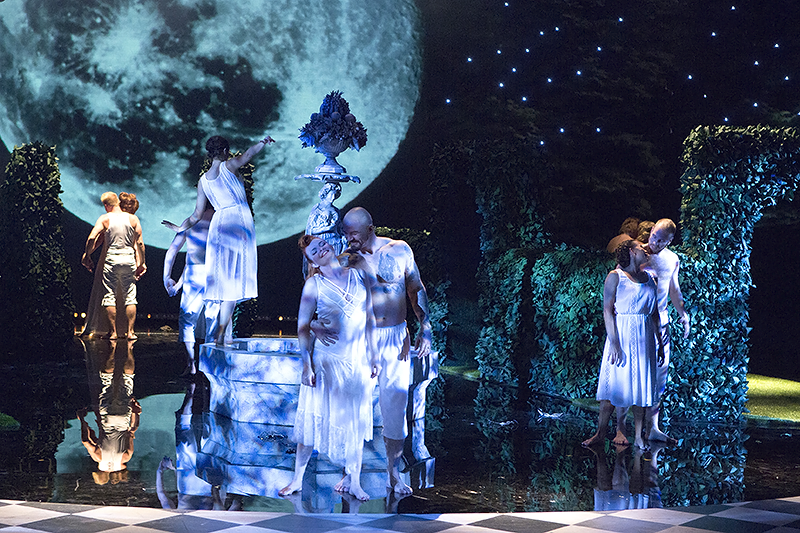 Finally, the tensions unravel during a midsummer night. I'm not a big Sondheim buff, but A Little Night Music is actually one of my all-time favourite musicals. I'm glad to see it return to Finland. And as always with favourite things, let's discuss the bad things first. My biggest problem with Tampereen Työväen Teatteri's production is the characterisation of Anne Egerman. 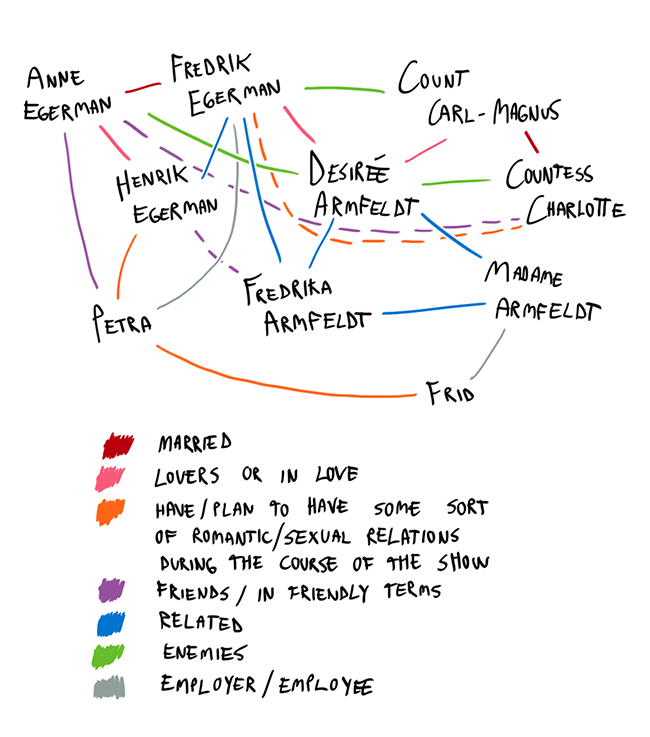 Anne is middle-aged Fredrik Egerman's 19-year-old wife. The bubbly young woman charms the whole Egerman household: Henrik, Fredrik's son from a previous marriage, is also head over heels in love with her. Anne is written as childish and immature, but sadly, Miika Muranen's direction turns her into a brat. Anna-Elisa Hannula is lovely whenever she has a somber moment, but those are few and far in between. For the most part, she is no more than an annoying kid. I really don't get what the Egerman men see in her. In general, Muranen's direction underlines certain jokes and parts of the script too heavily. During some scenes, it felt like the director didn't quite trust the text. A shame, since Juice Leskinen's Finnish translation of Hugh Wheeler's book and Stephen Sondheim's lyrics is a fine one and could certainly get the point across without any extra action. In the premiere, the first half of the first act still felt a little clumsy, I guess simply because of opening night nerves. The further the show progressed, the better it got. Things were underlined less, the pace got faster. By the end of the first act, I was laughing out loud, and by the end of the second one, wiping tears. During the second act, I don't think I stopped to mentally nitpick once. I just watched and enjoyed. The cast is a perfect fit. Sparks fly in between the leading couple, Veeti Kallio's Fredrik and Petra Karjalainen's Desirée, and the secondary couples deliver too. Not to mention the choir, commenting on the follies of the idle upper class leads with a beautiful mix of voices. Once again, my favourite actor Severi Saarinen is fantastic in his role, this time as the timid and inhibited priest-to-be Henrik. I believe he could act whichever part and I would be completely invested – of course he turns Henrik, a character I didn't much care for before, into one I cannot tear my eyes off of. Exactly what I expected would happen, really. Another true highlight is Tuire Salenius's Madame Armfeldt. 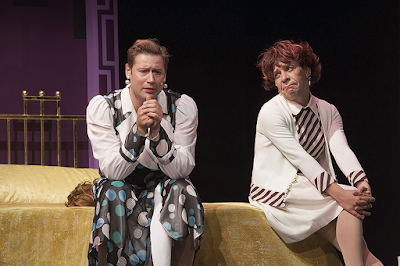 The character doesn't have plenty of time onstage, but Salenius makes every second count, timing her jokes perfectly. Love her! Visually, the production is stunning. I was amazed from the very first minute. Tarja Lapintie's costumes with their delicious candy colours, Eero Auvinen's beautiful lights and Hannu Lindholm's grand sets bring a bright dash of midsummer magic into the darkening autumn. I applaud Tampereen Työväen Teatteri for choosing A Little Night Music as their big musical for the autumn of 2015. It's clever, funny, touching, brilliant, and – apart from a couple of nitpicks – beautifully executed. I've a feeling I'm going to watch the musical several times more. And if you happen to be visiting Tampere this autumn, I recommend you'll take a look too. Lue myös Katrin, Lauran ja Tallen arvostelut. Being a musical fan for over six years, you're bound to amass some souvenirs. That's what has happened to me, at least: slowly but surely, my apartment has turned into a musical shrine. I have folders full of souvenir programmes and shelves stuffed with cast recordings. My walls are covered with theatre posters. 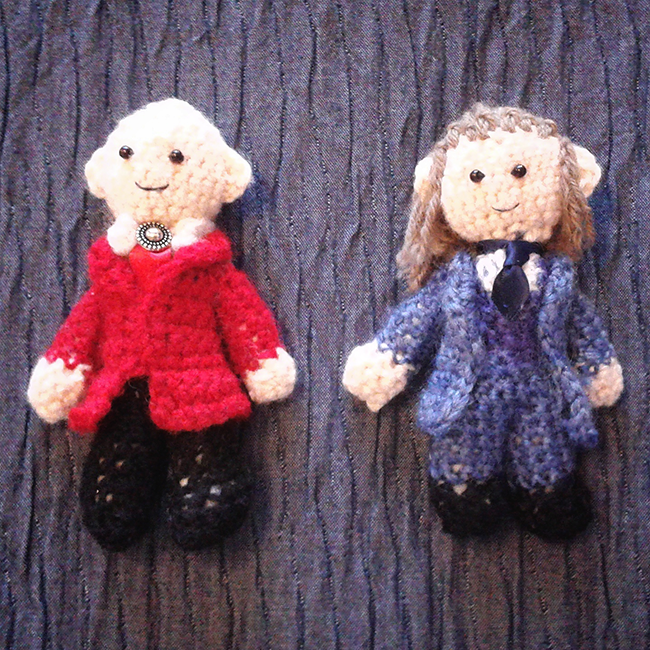 Once, I even commissioned handmade little dolls of my favourite musical characters – Dr. Jekyll and Mr. Utterson from the first Finnish production of Jekyll & Hyde – from a talented online friend. However. These are all nice things to own, fun stuff to decorate my apartment with, but no more than that (maybe apart from the dolls, I think I would save them if the house was on fire). The most important thing in theatre is of course the experience itself. The performaces, the music, the stories told onstage... Everything else is extra. If I had to choose, I'd much rather spend my money on a new theatre ticket than any trinket from a souvenir stand. 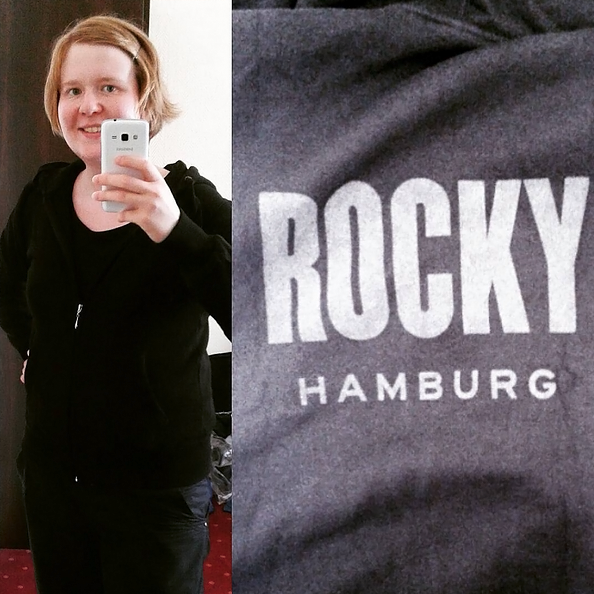 Except for the Rocky hoodie. I went to see Rocky the musical with no high expectations, looking forward an entertaining performance and nothing more. Killing time in the theatre's foyer before the performance, I took a look at the souvenir stand. Overpriced t-shirts and silly keychains shaped like boxing gloves. Who needs any of this! Nothing here for me. After the show, I was too excited to think about anything as mundane as purchasing merchandise. The show had blown my mind. 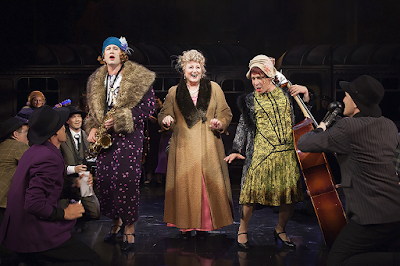 I was bursting with joy and excitement and also happy about getting to stagedoor the stars – something a Finnish theatre fan doesn't often get to do. But rushing happily towards the stagedoor, something displayed in the souvenir stand caught my eye. A black hoodie, with the musical's logo printed on the back in a different shade of black. Quite stylish for a souvenir... and at 40 €, worth a ticket to a Finnish musical performace. Quickly, I told myself I had been spending more than enough money during the trip already, and besides, I have a closet full of hoodies back home. Then I left the theatre for the stagedoor. Getting to meet the show's leading actor Drew Sarich cleared the hoodie out of my mind for the night. But in the morning, I remembered it. 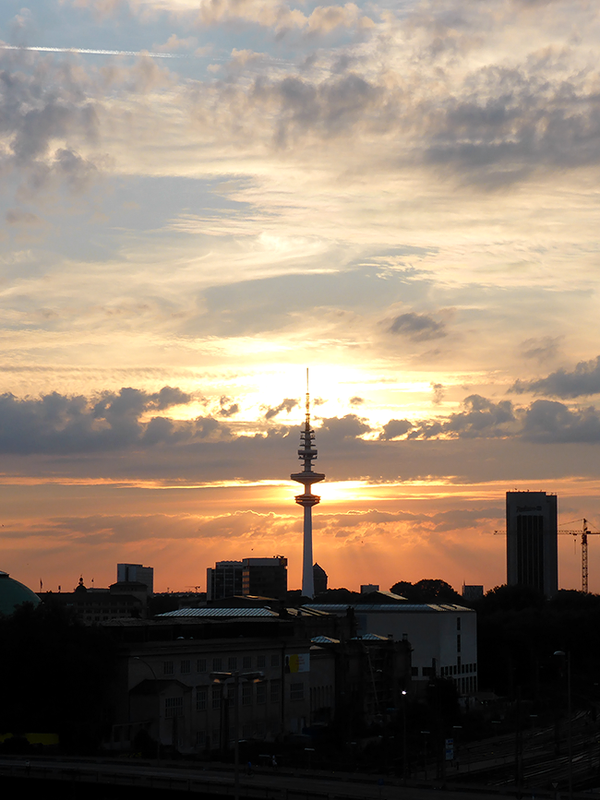 During the next two days, me and my travelling companion Lida walked in parks, went to The International Maritime Museum, watched the Hamburg Pride parade and visited the huge fairground Hamburger Dom. All this time, the hoodie haunted my mind. Hardly an hour passed without me thinking about it, no matter where we went or what we did. window could not distract me. In less than 24 hours, the piece of clothing turned into a burning obsession. I tried the money approach. I told myself I would regret it. I could buy a musical ticket with that money back home. Or two perfectly fine new hoodies from some clothing chain. I reminded myself my credit card balance was in the red already. I tried the fashion sense approach. Who wants to wear a black hoodie when all the colours of the rainbow exist! Besides, the letters on the back will fade away, probably in the first wash. I even tried talking sense to my suddenly obsessed brain. Would I really want to walk around advertsing, of all things, Rocky the Musical? Boxing, sports movies? Totally not my things. It would just attract weird looks. After a day, I thought about the hoodie four times more often than I thought about the musical itself. After a day and a half, I cracked. I told my friend Lida – using, angered at my own lack of self-control, rather more colourful language than I usually do – that I was going to take the underground to the theatre. The Sunday matinee had just started, so the souvenir stand should be open, during intermission at least. If I had to, I would sit on the steps outside the theatre until the show was over. I would not return without a Rocky hoodie. Him: “Are you serious? This show is trash." Him: "But the souvenir stand does open in twenty minutes." I have never regretted a purchase less. P.S. Listen to my favourite song from Rocky the Musical.